Porter Wright is proud to welcome W. Hunter West to the firm as an associate, who will focus his practice on complex commercial litigation. 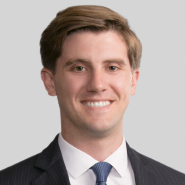 “Hunter is a great addition to our commercial litigation team,” said Jim Curphey, chair of the Litigation Department. "His enthusiasm and professionalism, especially at this stage of his career, will be a great asset as we continue to provide exceptional service and value to our clients." Prior to joining Porter Wright, West served as a Law Clerk for Magistrate Judge Norah McCann King as well as Magistrate Judge Elizabeth Preston Deavers, where he handled daily case management and pretrial matters for civil cases. During law school, he served as a judicial extern for the Honorable R. Guy Cole of the U.S. Court of Appeals for the Sixth Circuit. He served as a legal intern at the United State Department of Justice conducting research and drafting motions and memoranda regarding aspects of commercial litigation including government contract disputes, Veteran’s Affairs disputes and agency deference. West is a "Double Buckeye," receiving both his J.D. And undergraduate degrees from The Ohio State University.